Large - $32.99 Only 3 left! They're bright. They're yellow and they will definitely earn you some attention. When crime scene tape is being used, everyone stops and stares. Suddenly, all their attention is focused on what is hiding behind the yellow tape. We don't blame them. Yellow caution tape keeps you in suspense and makes you want to know more about the exciting event that just went down. 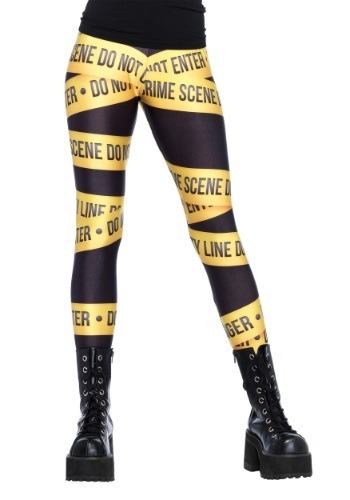 These crime scene tape leggings will cause a similar commotion. People will stop dead in their tracks when they see you wearing these uniquely printed leggings because it's not everyday that you see a girl incorporating crime scene tape into their wardrobe! These leggings, made up of polyester and spandex, will give you some authority no matter what you're doing or where you are going. You can choose to pair them with a cop costume or you can pair them with some combat boots and a black tunic for a fashionably "arresting" costume!